General information about legal and illegal highs. Information for parents and carers on talking to young people about legal and illegal highs and what to do if their children are using these drugs. Ed Sipler: Health Development Specialist in Alcohol, Drugs and Behaviour Change, South Eastern Health Care Trust (Northern Ireland Publication). 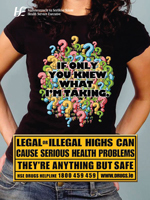 2013 revised HSE version of 'Cannabis and You: The biggest danger is forgetting what it really is ! This booklet is for anyone concerned that their cannabis use is affecting them in a negative way. Information on head shops and their products and advice around harm reduction for drug workers. Harm reduction information for individuals using psychoactive drugs - legal highs or otherwise. A safe injection guide from Merchants Quay Ireland. A Guide to Ethnobotanical Plants & Herbs, Synthetic Chemicals, Compounds and Products. Background information on legal, medical, social and historical facts about drugs used for nonmedical purposes in Ireland. This booklet is concerned with the concept and practice of harm reduction as a response to drugs issues in Irish society. Information you need to support your family member and to help you overcome many of the challenges that might arise as the person with ARBI progresses in rehabilitation and moves forward towards a brighter future. A comprehensive overview of the crucial roles that various disciplines can play in improving rehabilitative outcomes, and facilitates skill development amongst those professionals most likely to come into contact with ARBI. This booklet is for anyone concerned that their drinking is affecting them in a negative way. Examine your alcohol use and receive information and practical ideas thathelp you make choices that are right for you. Thinking of cutting down? Need some help? This booklet is for you. This code covered the sponsorship of, and activities surrounding, events involving the Alcohol Drinks Industry. At the request of the Department it particularly focused on music and sporting events. It was jointly agreed and implemented in May 2004. Addiction & mental illness: two problems, one person. Women and homelessness: a resource guide. This publication describes general fundamental elements of nutrition and training required for safe and effective muscle building. A resource for families living with addiction and problematic substance abuse. Information booklet that may be useful if you are pregnant or thinking about starting a family. It is written for women with a history of substance misuse or on methadone maintenance therapy. This manual will help all clubs to develop a Drug and Alcohol Policy. Developing a Club Drug and Alcohol Policy is central to every clubs response to this issue as it will enable every club to outline what can be done at local level, with the help of local professional services, to prevent and respond to alcohol and other drug problems. A sample policy has been added to the appendix to aid clubs in this regard. This publication outlines a framework to address issues that affect vinters and their ability to manage and maintain their premises. It includes a section on responsible serving, dealing with underage drinking, education and managing a drug-related incident. It also includes a directory of local services and a brief section containing information on some substances. A drug and alcohol policy provides a framework to address drug and alcohol issues in a supportive way while complying with responsibilities in relation to health and safety. This booklet aims to provide assistance to parents by outlining the views of experts in the field of adolescent development, and by sharing the lessons learned by parents, teachers, and teenagers from the various schools participating in this initiative. This booklet provides information on alcohol for young people and their parents to help them discuss drinking openly and honestly. It looks at how drinking alcohol might affect young people and highlights the services that are available when help is needed. Over the past 12 months, the NFSN has developed a Young Persons’ Support Programme (YPSP) and it is hoped it will be a helpful resource that Youth Projects, Drug Projects and Family Resource Centres can use in order to reach out to and support this vulnerable yet resilient demographic. The Young Persons’ Support Programme is a ten module activity based programme that supports the development of coping skills in young people living with problem drug or alcohol use in their homes. The modules are included below and the NFSN hope that by implementing such a programme, many Young People around Ireland will get the care and support that they need during a difficult period in their lives. Guidance for providers of health and social care services for children. Communicating in plain English with children and their families. Step by step toolkit. Preparing for work with children and young people who inject drugs. This tool is a product of a partnership between Harm Reduction International (HRI), Youth Rise, International HIV/AIDS Alliance and Save the Children and was developed in response to HRI research on injecting drug use among under 18s globally that highlighted gaps in the response for this group. This resource is intended for harm reduction service providers with limited experience of working with children and young people who inject drugs. It sets out a process that you can go through quickly, with little cost, to prepare for work with children and young people who are under 18. It is designed to help your organisation and staff to feel safe in commencing this work, and to support you in thinking through the challenging situations and decisions that you face. In some cases, it may lead you to decide that you are not yet ready to go ahead with this work. The Meitheal Toolkit is intended for use by practitioners using Meitheal – A National Practice Model for all agencies working with children, young people and their families. It provides direction, guidance and advice on all stages of the Meitheal process and as such can be used as a roadmap for undertaking a Meitheal effectively. A useful guide for parents on how to deal with teenage alcohol use. Either to delay a teenager from starting to drink or deal with the issue of a teenager that is already drinking. This guide is published by the HSE Alcohol Programme, 2018. Practical advice to help you communicate with your child about alcohol and other drugs. Finding out your son or daughter is drinking or using other drugs can be extremely difficult to deal with. This booklet is for parents and carers who find themselves in this situation. Making the Links is a guide to using materials from the Walk Tall Programme, the Relationships and Sexuality Education Programme (RSE) and the Stay Safe Programme. It is a response to requests from teachers for a comprehensive guide to using these materials in the context of the SPHE curriculum. This special supplement from the Irish Examiner provides information on a number of illicit drugs, advice for parents, and contact details for drug and alcohol agencies throughout the country. The purpose of this literature review was to conduct a comprehensive review of international and national research and literature in order to identify and document best practice with regard to primary and secondary prevention of substance use and identify and document the range and levels of current programmes, strategies, interventions resources available for parents in this regard. The report presents a snapshot of some aspects of young people’s lives, experiences, feeling and views in East Cork. They told us emphatically that they do not have adequate facilities; they identified where they go and what they do currently and what they would like to happen in the future. This includes recreational facilities and places to “hang around” with friends. They also identified the issues that concern them. Information on talking to your kids about drugs. This booklet aims to provide accurate evidence-based information to promote understanding of drugs and drug use. Includes definitions of terms, signs and symptoms of drug use, responses to drug use situations within a school context, guidelines for speaking about drugs, contacts and resources list. The document has also undergone a national consultation process involving both internal and external agencies. This document provides a framework for developing good practice in dealing with drug related issues on the ground and, via the Appendices that are included, provide the additional source materials, legal information and contacts required to respond in as effective a manner as is possible when faced with dealing with issues of drug use by young people. This programme was set up to help pupils to improve their knowledge attitudes and skills, so they will be motivated and able to avoid drug misuse. It is recommended that the programme should be set in the wider context of Health Promotion and Health Education. It should include sections on self esteem, decision making, coping with feeling, positive attitudes to health and taking responsibility for one's own well being. The programme is divided into five days, with notes and methods for each day included. This draft handbook has been designed to help coordinators, teachers and school management organise meaningful and sustainable SPHE programmes in their schools. The central objective of a school’s substance use policy is the welfare, care and protection of every young person in line with the Education Act, 1998 and the Education (Welfare) Act, 2000. The policy should address both education concerning alcohol, tobacco and drugs and the procedures for managing incidents relating to these substances. Lesson plans designed for a ten-session programme for prevention of drug misuse for groups aged 11-12 years. Essentially, this is a support manual, which will be a practical resource and reference guide for those who are involved in the development of drug related policy and strategy. The training that accompanies this manual is targeted at individuals who have advanced knowledge of drug issues and an appreciation of the value of Youth Work approaches. These draft guidelines are designed to support teachers in implementing the SPHE curriculum in the classroom and in designing teaching and learning that will meet the overall aims of SPHE and the particular objectives associated with each topic. This manual aims to introduce those working with young people to good practice in health promotion. The curriculum is structured in such a way as to treat the social, personal and health dimensions of the child’s life in an integrated manner. It provides for the development of a broad range of values, attitudes, skills and understanding relevant to the child’s health and wellbeing, to other people, and to the society in which he/she lives.